German Chancellor Angela Merkel and French President Emmanuel Macron have signed a contract to renew the friendship and cooperation between the two countries on Tuesday. "We reaffirm that we want to tackle the great challenges of our time hand in hand," Merkel said during her speech in the city hall of Aachen. 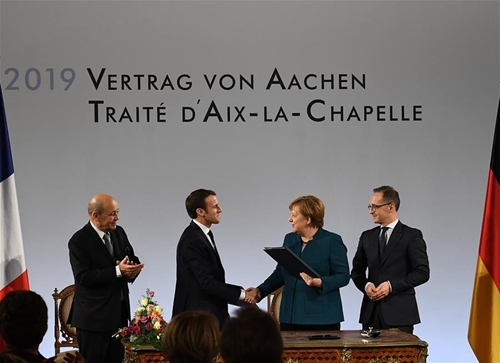 The so-called treaty of Aachen, signed by Merkel and Macron, seeks closer cooperation between Germany and France in economic, defense and European policy. In a Europe threatened by nationalistic tendencies, economic problems and terrorism, it would be particularly important that Germany and France "speak with one voice", Macron said during his speech. The treaty of Aachen ties in with the Elysee treaty, signed in 1963. Speaking to Xinhua on Tuesday, Eileen Keller of the German-Franco institute dfi, said that the new Aachen treaty would build "in many ways on the Elysee treaty, reiterating many of the dimensions that have been fundamental to Franco-German cooperation over the past decades." However, Keller added there were several areas in which the Aachen treaty would go beyond the "status quo" such as defense, trans-border cooperation and support for civil society initiatives. 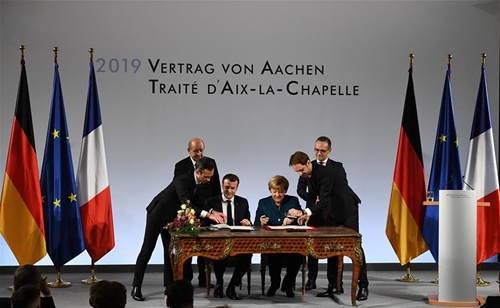 The treaty of Aachen, with which the two countries seek to coordinate their positions in the European Union more closely and create a German-French economic area, describes future fields for cooperation in 28 chapters. "While France and Germany have successfully shaped the European agenda and achieved considerable progress in the past, their influence has become more circumscribed the larger the EU has become", Keller points out. In advance, negotiators of both governments had agreed on a list of 15 joint projects, the German press agency (dpa) reported. 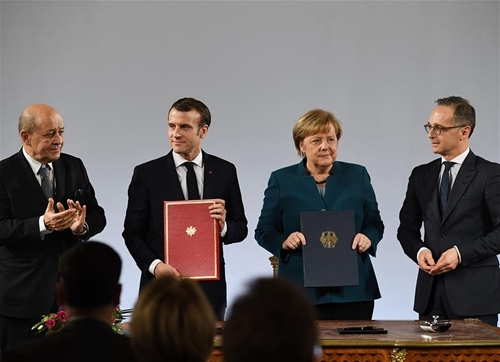 Among other things, the talks covered cross-border rail connections, a strengthening of cooperation on climate and energy issues as well as the establishment of a Franco-German research network. The shutdown of the French nuclear power plant Fessenheim near the German border has also been discussed. Merkel said during her speech in Aachen that the treaty would be concluded at a time of growing populism and that the "seemingly self-evident" would be called into question again. Merkel added that the Aachen treaty would renew the "foundation of cooperation between our countries". The treaty also stipulates that military cooperation is to be strengthened and that common rules for arms exports are to be established. Both countries promise in the treaty to provide mutual assistance "in the event of an armed attack".